Sen. Elizabeth Warren attacked President Trump's labor secretary nominee Alexander Acosta after he declined to say whether he would overturn several Obama administration regulations during his first confirmation hearing Wednesday. Warren (D., Mass. ), a member of the Senate Committee on Health, Education, Labor, & Pensions, asked Acosta whether he would direct the Labor Department to defend new overtime regulations in federal court after an Obama-appointed judge blocked them from going into effect, as well as whether he supported Trump's executive orders affecting safety and financial regulations. The Massachusetts senator, a champion of the Democrat's liberal base, prodded Acosta to take a public stance against President Trump. The nominee did not bite, saying he would not weigh in on such manners because the president sets policy. The back and forth led Warren to accuse him of dodging "every one of my questions" and hiding "behind an executive order." "I haven't spoken to individuals at the Department of Labor [about the policies] because I have not been confirmed," Acosta said. "If you cant give me straight answers on your views on this … and commit to stand behind workers then I don’t have any confidence you're the right person for this job," Warren said. Committee Chairman Lamar Alexander (R., Tenn.) came to Acosta's defense, calling it "presumptuous" for an appointee to set policy before even being confirmed. "I wouldn’t have the confidence that you're the person for this job if you did answer these questions," Alexander said. "I think it's thoroughly reasonable of you to review a regulation according to the president's direction." The Trump administration has set out to refocus the Labor Department to focus on job growth rather than regulatory enforcement. His budget blueprint called for a 21 percent cut to the Labor Department's budget and to return some functions of the agency to state and localities who are closer to the employment situation in their communities. "With the need to rebuild the Nation’s military without increasing the deficit, this Budget focuses the Department of Labor on its highest priority functions and disinvests in activities that are duplicative, unnecessary, unproven, or ineffective," the blueprint says in its labor section. Ranking Democrat Sen. Patty Murray (D., Wash.) focused her line of questioning on the department's Women's Bureau, asking Acosta if he planned on fighting against cuts to that section. Acosta said budgetary decisions ultimately came down to the White House recommendations and Congress' allocations, adding that he sees equality as a priority for the department. "If everything becomes a priority, things are no longer priorities … We talk about small businesses and women running small businesses is a great thing and that's something the DOL should focus on," he said. "I believe in a unitary executive. I don’t think any cabinet secretary can make [budget] commitments because we have a boss." 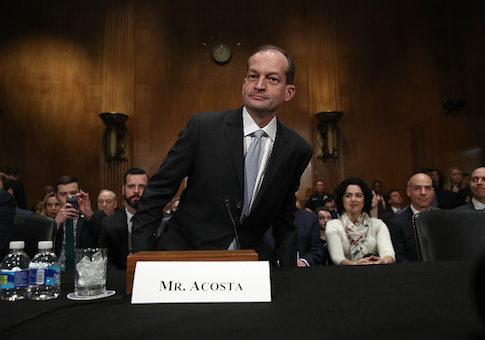 Murray, who has collected $2.1 million in campaign donations from organized labor, later quizzed Acosta about whether he felt he could stand up to political pressure. Acosta said his career as a public servant has given him experience operating in a political environment. He has been confirmed by the Senate to three different senior cabinet positions, including a brief stint at the National Labor Relations Board. He said that he would carry out the orders of the president or resign if he found himself at odds with the White House's direction. "I have been in public service the better part of my professional career and I've seen pressure and I don’t for a second believe that senior officials would or should bow to political pressure. We work for the president. He is our boss … we all will ultimately follow his direction," Acosta said. "If we cant, then we resign. That's our choice." Acosta, a law school dean, is the second man nominated to lead the Labor Department after Trump's initial pick, fast food executive Andy Puzder withdrew from consideration in February. Acosta has won the endorsements from several labor unions, as well as industry groups, and is expected to be confirmed to the position. The committee is expected to vote on the nomination next week, according to committee officials, though no date has been set. This entry was posted in Issues and tagged Alexander Acosta, Department of Labor, Elizabeth Warren. Bookmark the permalink.